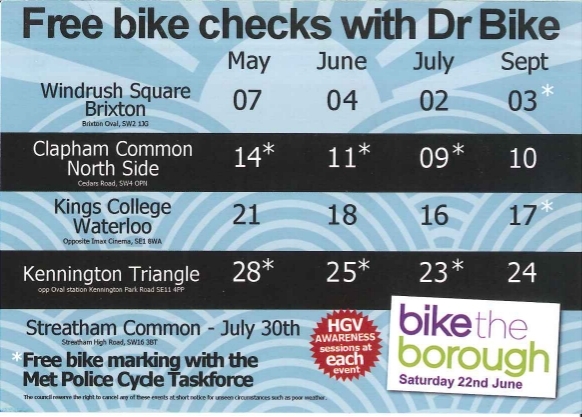 Come and get a safety check and adjustments to your bike as well as information and advice on cycling in Lambeth this evening, 10 September 2013, on Clapham Common Northside (opposite Cedars Road), SW4. The session will run 5:30-7:30pm. 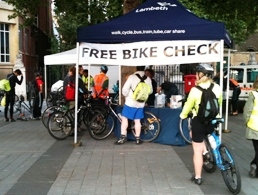 Lambeth’s Sustainable Travel Dr Bike team will be returning in September to offer check ups every Tuesday evening to keep your bike running on through the autumn and winter months. They will also have free gifts of lights to give out to the first 50 people at each session as well as information and advice.